Unfortunately you can’t really rely on the French. Or, to be more precise in this instance, you can’t rely on the French weather. For the past week or more the UK has enjoyed wonderful weather – temperatures in the 30s, bright blue skies, not a drop of rain. And what do we get the moment we arrive in La Belle France? Rain! Not torrential, but just enough to make you wonder why, if it wasn’t for the weather, you left home. Still, mustn’t grumble. After an early start the ferry from Portsmouth to Caen was a painless experience. A few schoolchildren running about screaming and generally enjoying themselves, but not so much that we came close to sending any of them over the side. We were consoled by the thought that their teachers would be suffering more, and for much longer, than us. The drive from Caen down to Gouarec took quite a bit longer than I’d anticipated. At three and a half hours I’m now concerned that it may be just a little too long for our September trip with the Tufty Club – so at some stage I’ll investigate whether we might be able to change the tickets to the Portsmouth/St Malo route instead. 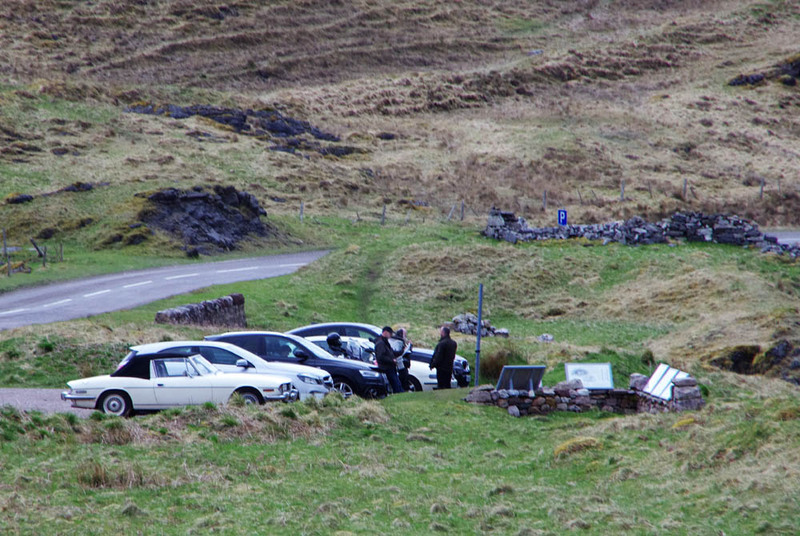 The camping site at Gouarec is a bit like the ‘curate’s egg’ – good in parts. 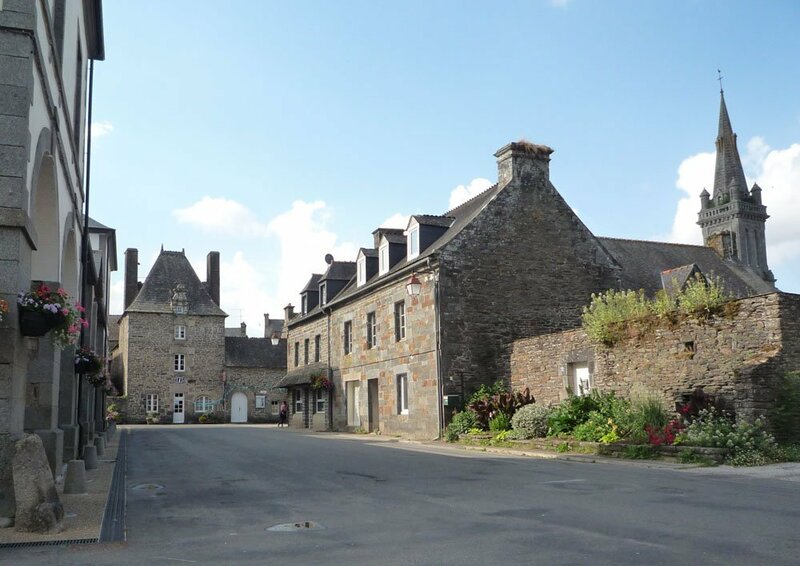 The location is wonderful – situated on the side of the Nantes-Brest Canal and within easy staggering distance of a few shops, a couple of restaurants and at least one bar – what more could we want or need. Unfortunately the site itself is rather dilapidated and needs a good ‘sort out’ – nothing that a large tub of Jif, a pair of marigolds and a couple of hours with a strimmer couldn’t resolve, but not what you’d call ‘smart’. Still, mustn’t grumble. We spent the day doing not very much at all. 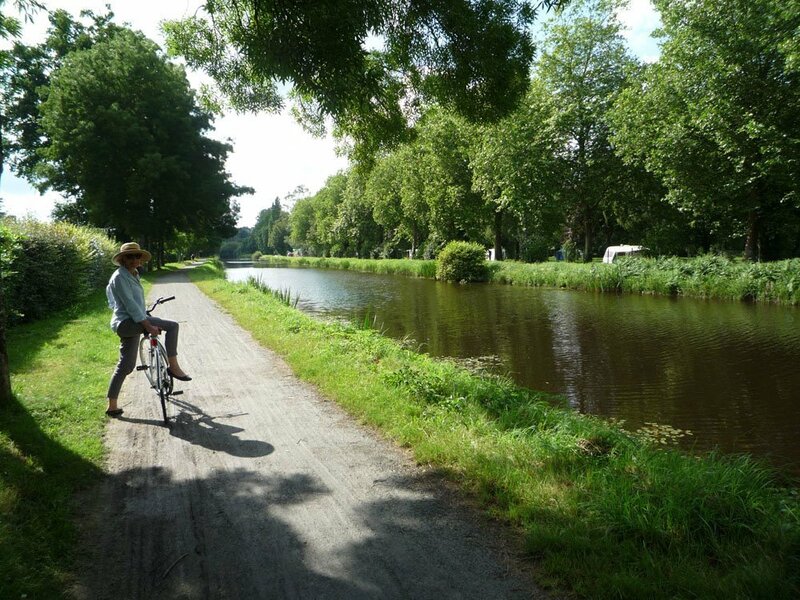 A morning cycle ride along the canal bank brought us to the Abbeé de Bon Repos which looked interesting (though we didn’t investigate) whilst the afternoon involved a snooze, a bit of reading and another bike ride. 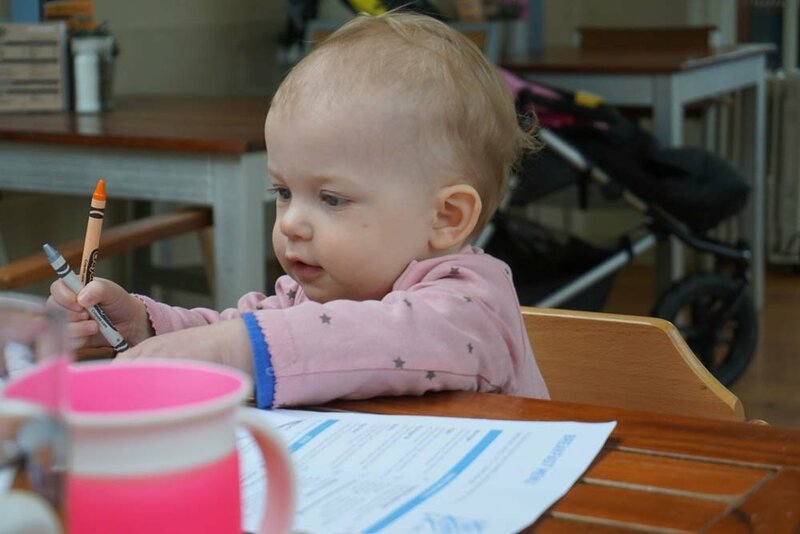 It’s a hard life if you don’t weaken – mustn’t grumble. From Colluden we headed south, spending the evening in Grantown on Spey in the heart of the Cairngorms before heading on to Scone just north of Perth. Our campsite was (and hopefully still is) on the edge of the racecourse, which in turn is adjacent to The Palace of Scone (pronounced ‘Scoon’ and apparently written variously as Scon, Scoon, Scoan, Scoine, Schone, Skoon, Skune, Skuyn, Skuyne, Sgoin, Sgàin and Sgoinde. Whoever said that blogs couldn’t be educational?) As is happens our visit coincided with the International Medieval Combat Federation’s annual dust-up, presumably they selected Scotland as a venue on the basis that it would be a good place to start a fight? 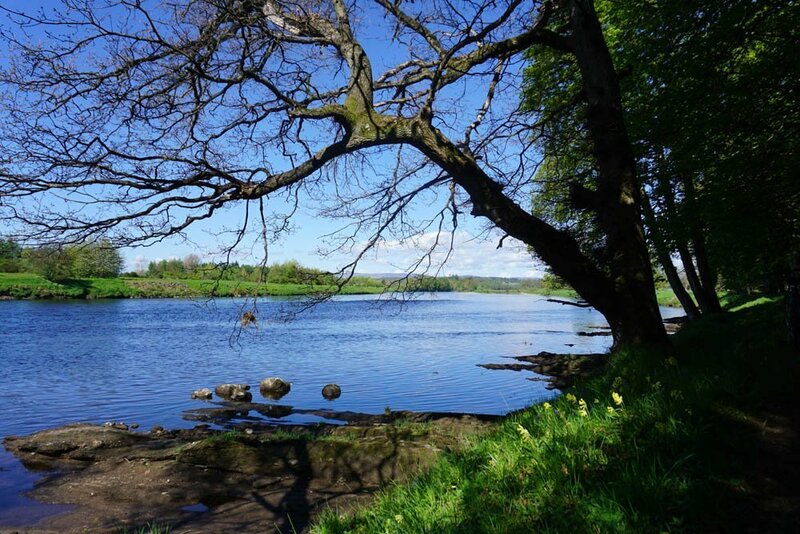 Having failed to blag our way in for free to see a bit of gratuitous violence we opted instead for a cycle ride along the banks of the River Tay, which was an altogether quieter, and probably more enjoyable, experience. 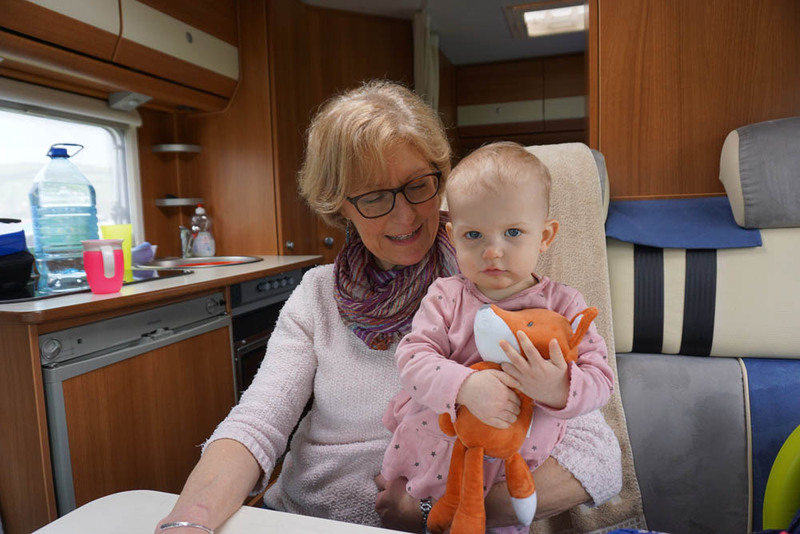 The final night of our trip was spent at the campsite in Bellingham where, having failed to book in advance, we fortunately managed to secure the last available space – albeit we had to settle for a slot in the carpark. 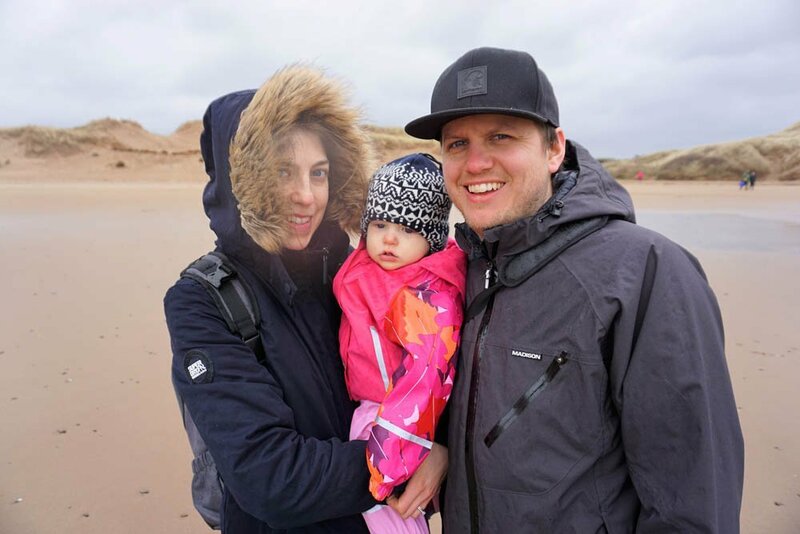 Next morning, after a flying visit for coffee with the Brown family at Wark, we managed to fit in a great walk along a section of Hadrian’s Wall at Steel Rigg. 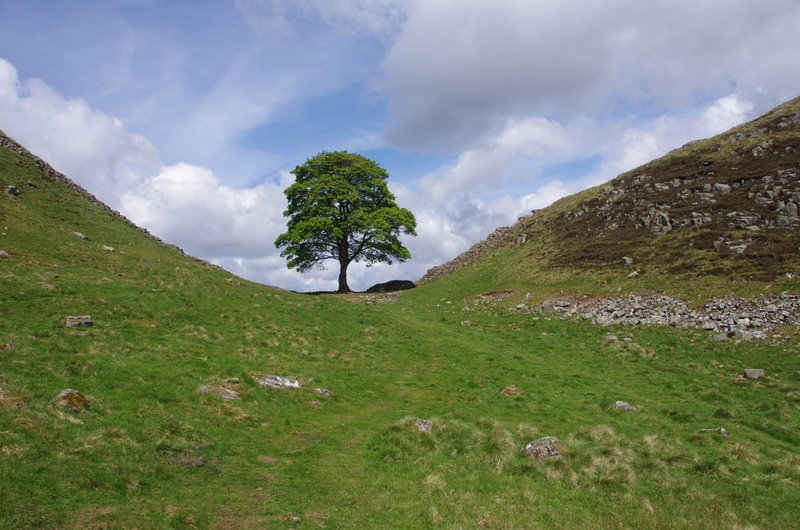 Our stroll included Sycamore Gap which was famously shown in the 1991 film Robin Hood Prince of Thieves – quite how Kevin Costner managed to get from there to Nottingham so quickly remains a mystery to me. “Tonight we dine in my father’s house in Nottingham” – yeah right! The weather was kind and views along this part of the Wall are fantastic; all-in-all an excellent conclusion to a great holiday. One of the basic and immutable laws of holiday blogging is ‘the longer the blog goes on, the less frequent the entries become’. It’s not that you have less to say, just that for some reason as the days go on it becomes more of an effort to remember where you’ve been and what you’ve done. So that’s my excuse sorted, now let’s get on with the blog. The weather in the Scottish Highlands in May can be wonderful – in fact I think that I may have promised as much when I first raised this trip as a possibility. To be fair we have had some sunshine and there have been days when it hasn’t rained too much, but in all honesty the weather has been just a little unkind and not quite what we had hoped for. For night 7 we wild-camped just above the picturesque village of Sheildaig where the wind blew and the rain hammered down on the Van giving us a true Highland experience. Fortunately we managed to fit in a short walk to the village pub before the weather set in, and as we arrived ‘home’ we watched the Hebridean Princess as she anchored for the night in Loch Sheildaig. Now, that’s one way to tour the Scottish coastline in real luxury- and at only £500/night per passenger, what a bargain! From Sheildaig we headed south towards Loch Carron. On balance we decided to give Applecross a miss – the weather was poor and the prospect of yet more difficult single-track roads didn’t really appeal. Plus, we decided that Denise’s buttocks probably weren’t up to the challenge. 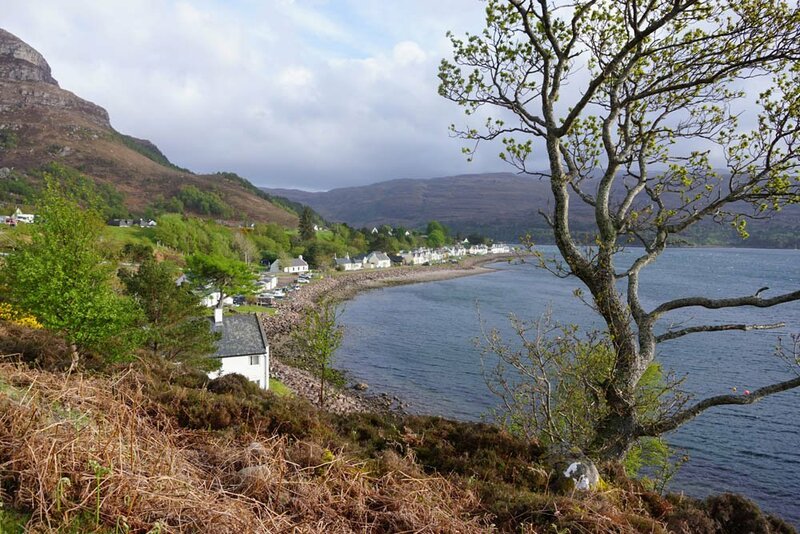 From Loch Carron we headed back towards Inverness and in doing so we completed the North Coast 500 and the circumnavigation – disappointingly there was no fanfare, though we gave ourselves a well-deserved pat on the back. With a little time to spare and a decent break in the clouds we decided to visit Culloden which, along with our superior World Cup record, is one of the many things for which the Scots won’t forgive the English. We struck lucky and arrived just in time to join an excellent short tour led by our guide, Raymond, who not only had all the facts of the 1746 battle at his fingertips but even managed at one stage to get his audience marching around the battlefield in three ranks. He explained how Bonnie Prince Charlie managed to turn a potentially winning position into a complete military disaster –the fact that as a Scot he told the story without once uttering those immortal words ‘we was robbed’ was especially impressive. Day 6 took us from The Kyle of Tongue around Loch Ereboll, past Durness and down to Scourie. The scenery in this far corner of North West Sutherland is impressive, not least for the feeling of emptiness it imparts to those passing through. If you’re turned-on by wide open spaces with nothing but moorland, water and mountains then forget New Zealand and save yourself the airfare to the southern hemisphere. Ask yourself why(apart from the fact he’s a Kiwi) did Peter Jackson decide to go all that way to film The Lord of the Rings when he had everything he needed on the doorstep? The scenery’s perfect and Gaelic even sounds like a cross between Elvish and Orkish. 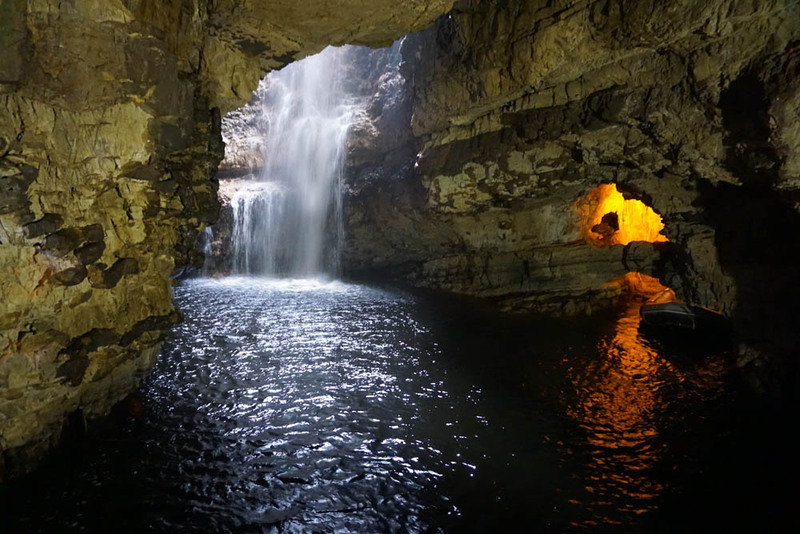 The caves at Smoo (yes, really) were a worthwhile stop. A narrow and deep rocky inlet leads into a series of massive caves that have apparently seen human habitation for thousands of years – including use by marauding Vikings (I’m not sure why, but Vikings somehow just have to be described as ‘marauding’ –whoever heard of ‘visiting’ Vikings?). 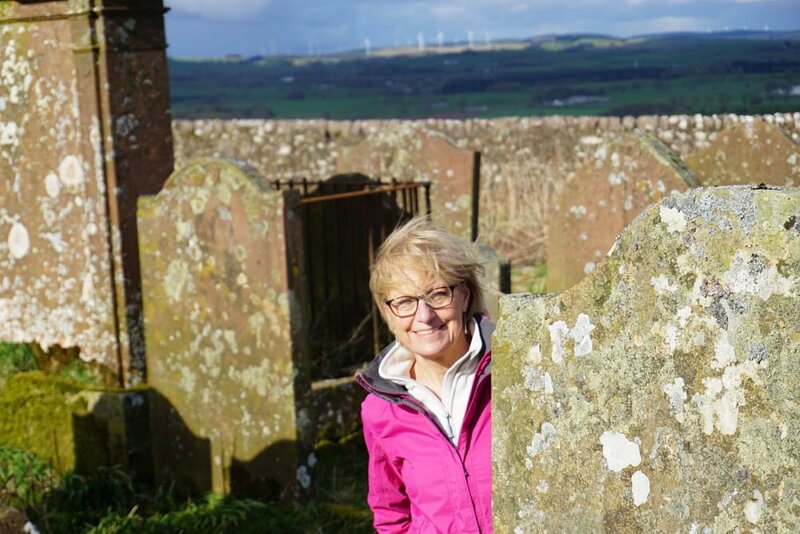 A short evening stroll from the campsite at Scourie up to the overlooking headland took us past the local cemetery which we noticed contains a single military war grave of a young sailor who died on 26th December 1939. Presumably he was lost from a passing Royal Navy warship and buried where he came ashore. Over the years we’ve visited a good many Commonwealth War Grave Commission cemeteries, all of which have been kept in wonderful condition. This particular gravestone, however, was badly worn to the point where it was almost undecipherable and the grave was obviously untended and rather sad. A snottagram to the CWGC will follow shortly. From Scourie we took the ‘B’ road that skirts Eddrachillis Bay through Drumbeg before re-joining the main road just short of Lochinver. The twenty-five mile detour took about two hours with much of the journey done in first or second gear with Denise clenching her buttocks or stretching for the brake pedal every time we went over a blind rise or down a steep slope; given that I was driving neither action had much effect on our progress but was probably excellent exercise. 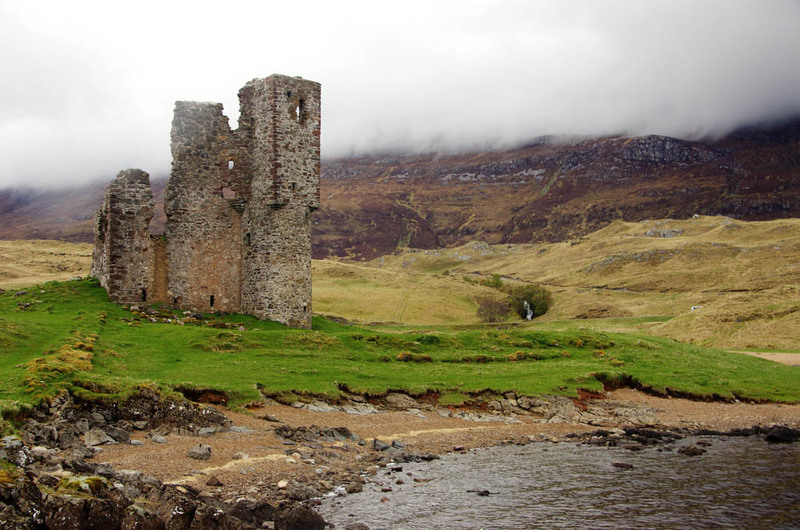 The drive from Lochinver down to Ullapool was pleasant but uneventful, though we stopped briefly to visit another scenic ruin at Ardvreck Castle, tutting under our breath at those who seemed unable to understand the signs which implored visitors not to clamber on the fragile ruins. Ullapool itself is a nice little fishing port which also acts as the terminal for the ferry to Stornaway. 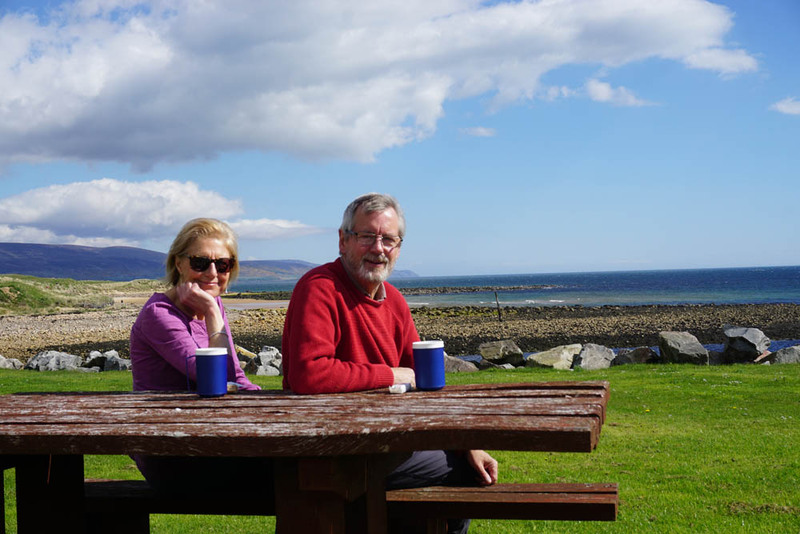 After a short cycle ride we enjoyed a fish and chip supper whilst chatting to a couple who entertained us with hair-raising tales about the minor road that we’d planned to take to Applecross the next day. We’ll have to see whether Denise’s buttocks will allow us to take that particular route. A rare sighting of a Highland Stag! Blogging is like Pringles – once you pop, you just can’t stop. Or, at least, if you do stop you leave a story uncompleted, and that would never do. That said, you do have to have the ‘muse’ with you (whatever a muse may be) if you’re going to produce something worth reading, and my muse seems to have been AWOL for the past couple of days. The scenery has been fantastic, the roads empty the company wonderful (of course) and the whole experience enjoyable – just no muse. No matter, plenty of time to catch up, so long as we’re spared. We made the right call by deciding to tackle the journey in an anti-clockwise direction. 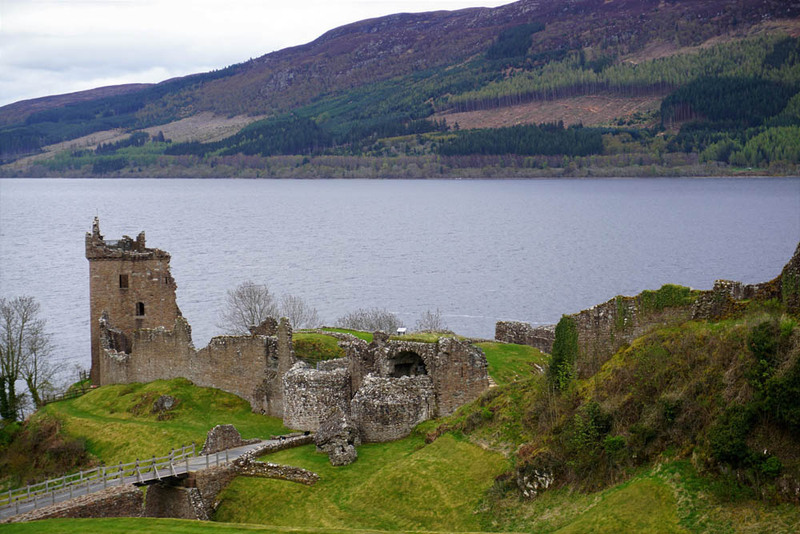 Against all expectations the leg from Loch Ness up the east coast was more interesting and varied than we’d expected. We suspect that those who tackle NC500 the other way around are probably knackered or bored by the time they reach John O’Groats and therefore miss out on much that the north east corner has to offer – simply because they want or need to get home in a hurry. Their loss, our gain. After stopping for lunch at Tain we spent the night at ‘the campsite that time forgot’ just north of Lairg. Run by the lovely and unshaven Mrs Ross it would probably be best described as ‘basic’. 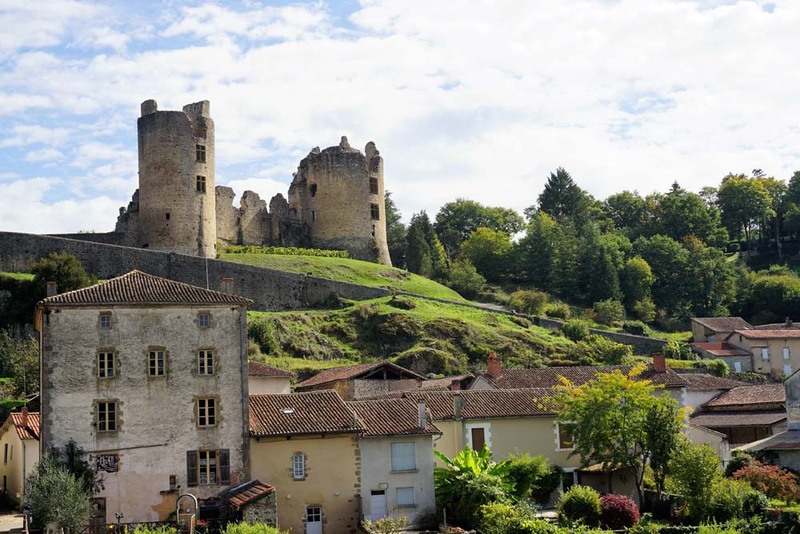 We shared the site with a caravan, one other camper van and a minibus load of young Frenchmen who looked to be totally unprepared for a night under canvas. In the true spirit of European unity we ignored them and enjoyed the wild and beautiful scenery of Loch Shin. Our journey up the east coast the next day was lovely. The sun shone and the sea sparkled. We spent Night 4 at a nice little campsite in Wick. The Victorian town centre was just a short walk away but had nothing to offer – or, at least, nothing that we wanted. Supermarkets on the edge of town have killed off any small businesses that might have otherwise given the place some character and the resulting vacuum has been filled by takeaways and not much else. The countryside changes as you leave Wick heading north to John O’Groats. The landscape becomes suddenly featureless and grey – no hills, no trees and the houses seemed to be ‘poorer’ than those we’d passed just a few miles earlier. John O’Groats itself is OK, but if it wasn’t the most northerly town (!) in the UK it wouldn’t have much to recommend it. 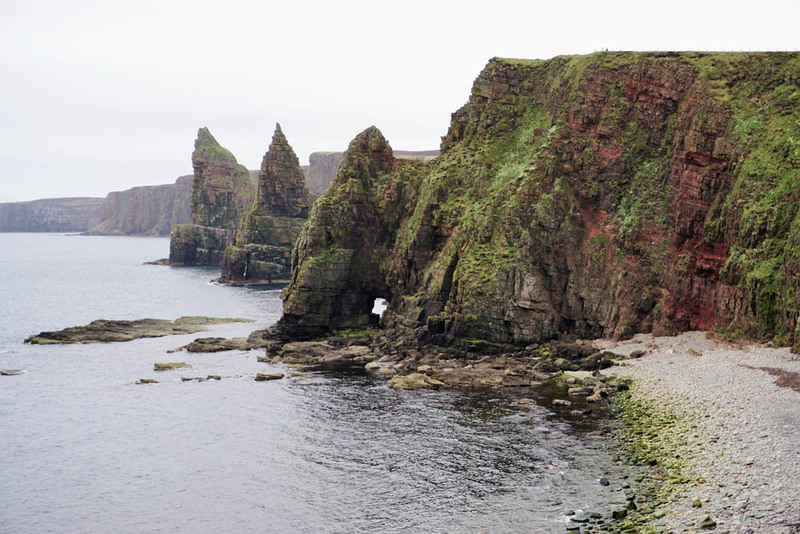 Nearby Duncansby Head on the other hand provided a pleasant walk along the clifftops and great views of the Orkneys and of Muckle Stack and its companions. The drive along the A836 across the ‘top of Scotland’ to our next overnight stop at Tongue was pleasant and uneventful; once we were past Thurso the countryside once again became interesting and decidedly less grey – helped no doubt by the sun making a welcome appearance and some lovely, deserted beaches and stunning mountain views. Night 5 was spent in the car park of The Tongue Hotel. As this just happened to be our Ruby Wedding Anniversary (Denise was a child bride) we treated ourselves to a fine meal in the hotel’s very comfortable surroundings, having first enjoyed a testing little walk up to Varrich Castle which may very well be the smallest castle with the best views in this part of Scotland. You take the high road ….. Decisions, decisions! Everything we’ve read about the North Coast 500 (NC500) tells us that the accepted practice is to tackle the route in a clockwise direction. Why is that? Are the views better in one direction than the other? Are some of the roads ‘one-way’? Now, we don’t want to be awkward, but the forecast for the next week is for the weather on the East coast to be better than on the West …. so we just wondered ….. if we go around in the other direction will we upset the applecart , get drummed out of the Brownies or just piss off the locals? As tonight finds us just to the south west of Inverness it will be ‘decision day’ tomorrow. Such excitement; far more than one man can bear. Today was mainly damp, or dreech as its known around here. Not that we were much bothered by a bit of rain, but it did rather obscure the views as we made our way up from Glasgow, past Loch Lomond, through Glen Coe and around the foot of Ben Nevis before heading up the Great Glen and along the banks of Loch Ness to our overnight stop here at Lewiston just short of Drumnadrochit. Fortunately the weather eased off as we arrived, just in time for a short walk down to the Loch with views over Castle Urquhart and a stroll to the local for a pint of that well known Scottish brew – cider. Are we cosmopolitan or what? Veronica Ann, Erin Beth, Anya Rose, Kathryn Jane and Angela Vera. 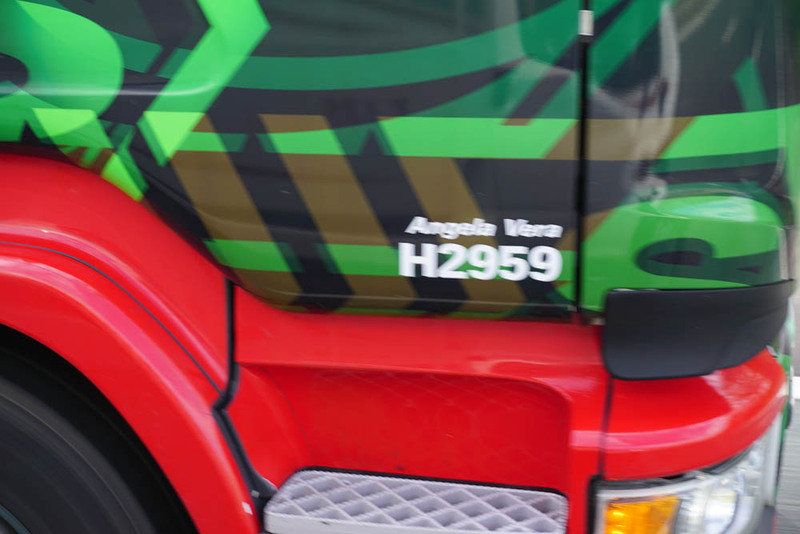 Isn’t it strange how Eddie Stobart’s lorries always seem to have such posh names? Not that I’m complaining of course – after all it makes a pleasant change from Scania, Volvo, Bedford (showing my age there I think) and the like. Anyway, we passed these particular beauties en-route from home to Scotland earlier today – perhaps now that we’re north of the border we’ll encounter Morag, Fiona and Janet plying their way around the highways and byways of Scotland? Whilst I’m on the subject of Mr Stobart’s fleet I do think it a bit of a retrograde step for him to allow his drivers to ‘dress down’ by shedding their ties. Not that it makes them any less capable as drivers of course…….. but standards, Eddie, standards! Our first stop (not counting obligatory pee stops every two hours on the motorway) is at Hoddom Castle a few miles from the wonderfully named Ecclefechan, just north of the border. 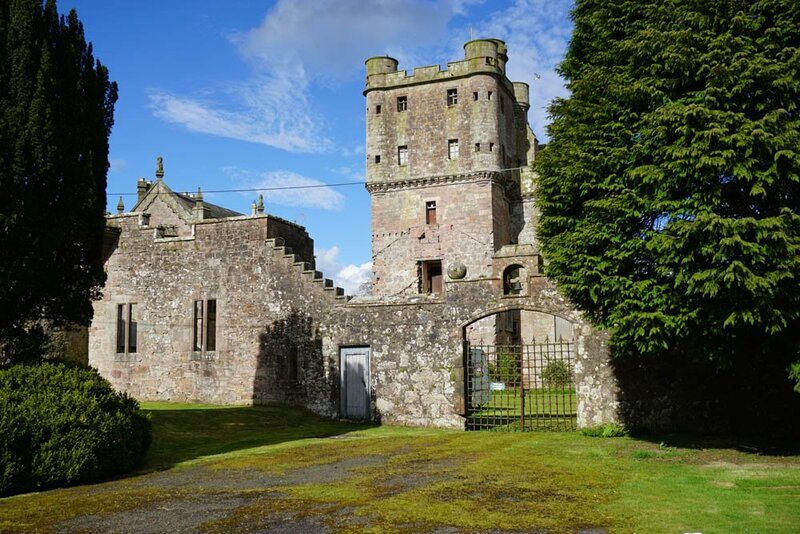 The castle itself has undoubtedly seen better days but still makes an imposing ruin and a good focus for the campsite – which I’m happy to say is pleasantly empty. For once the English can’t be blamed for knocking the place about from time to time over the past 600 years – the Scots seem to have managed that all on their own. What, Scotsmen looking for a fight? Who’d have thought it! A short walk up a nearby hill to the aptly named Repentance Tower (if it had been any steeper I’m sure I’d have been meeting my maker) was rewarded by great 360 degree views over some wonderful countryside in the evening sunlight. No, I’ve not taken to using profanities in my blog, but when you’ve had the privilege of visiting The Bloody Tower its important to say so. 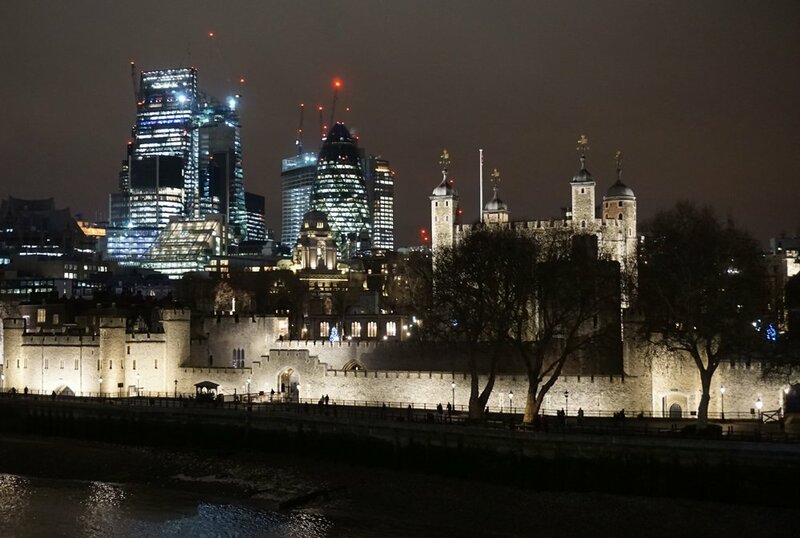 In point of fact not only did we see The Bloody Tower but we also saw The White Tower, St Thomas’s Tower and most of the other 16 towers that make up The Tower of London. Friday evening was a very special event. Having been invited by Nick and Maggie, otherwise known as Lord and Lady Houghton of Richmond (as Nick is Constable of the Tower they’re fortunate enough to live over the shop), we were privileged to enjoy supper in The Tower with them and eight fellow guests, and to attend a wonderful Carol Concert in the Chapel of St Peter Ad Vincula performed by the Choir of the Chapels Royal, HM Tower of London. 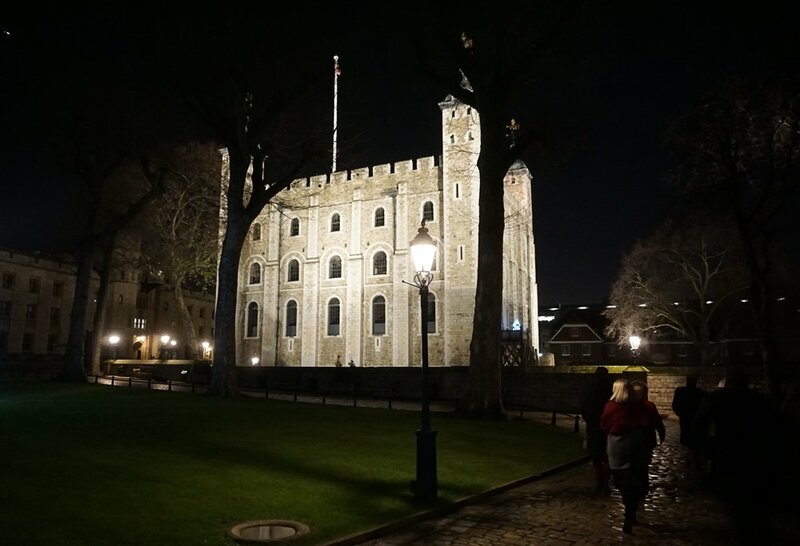 The evening started with a short tour and whistle-stop history of The Tower given by ‘Barney’ one of the Yeoman Warders. Quite how he managed to pack 940 years of history into 30 minutes I’m not entirely sure, but suffice to say that he had all the patter and most of the facts at his fingertips. Nick and Maggie live in ‘The Queen’s House’ which was built around 1540 and is supposedly the most original timber-frame dwelling in London having missed the ravages of the Great Fire (it’s built into the inner wall of The Tower itself) and the best efforts of Hitler’s bombers. In their cellar is the room in which Sir Thomas Moore was imprisoned for 15 months before his execution, and in the space now occupied by their dining room Guido Fawkes was interrogated following the failed plot to blow up Parliament. So there’s a bit of history about the place! The Choir Concert was fantastic and completely up to the standards you’d expect of the venue – Queen Anne Boleyn was executed just outside the Chapel and re-united with her head before being buried under the altar. Supper in The Queen’s House was interrupted briefly at 10 o’clock while we observed the Ceremony of the Keys, which is apparently the oldest unchanged ceremony of its kind in the world and has only been missed once in the past several hundred years (on one occasion it was delayed by an air raid – which earned the Constable a sharp rebuke from King George VI). I remember attending the ceremony once before as a ten year old on a family holiday to London and can therefore say with some authority that it hasn’t changed noticeably in the last 55 years. All in all it was a wonderful evening and we will be eternally grateful to Maggie and Nick for allowing us to enjoy such a special event in those historic surroundings. We hope that they’ll come and visit us soon so that I can repay their hospitality by giving them a guided tour of the Ewbank car collection!